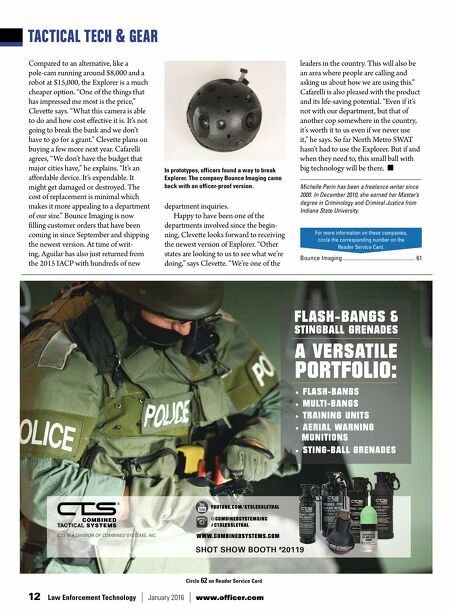 TACTICAL TECH & GEAR 12 Law Enforcement Technology January 2016 www.officer.com Compared to an alternative, like a pole-cam running around $8,000 and a robot at $15,000, the Explorer is a much cheaper option. "One of the things that has impressed me most is the price," Clevette says. "What this camera is able to do and how cost effective it is. It's not going to break the bank and we don't have to go for a grant." Clevette plans on buying a few more next year. Cafarelli agrees, "We don't have the budget that major cities have," he explains. "It's an affordable device. It's expendable. It might get damaged or destroyed. The cost of replacement is minimal which makes it more appealing to a department of our size." Bounce Imaging is now filling customer orders that have been coming in since September and shipping the newest version. At time of writ- ing, Aguilar has also just returned from the 2015 IACP with hundreds of new department inquiries. Happy to have been one of the departments involved since the begin- ning, Clevette looks forward to receiving the newest version of Explorer. "Other states are looking to us to see what we're doing," says Clevette. "We're one of the leaders in the country. This will also be an area where people are calling and asking us about how we are using this." Cafarelli is also pleased with the product and its life-saving potential. 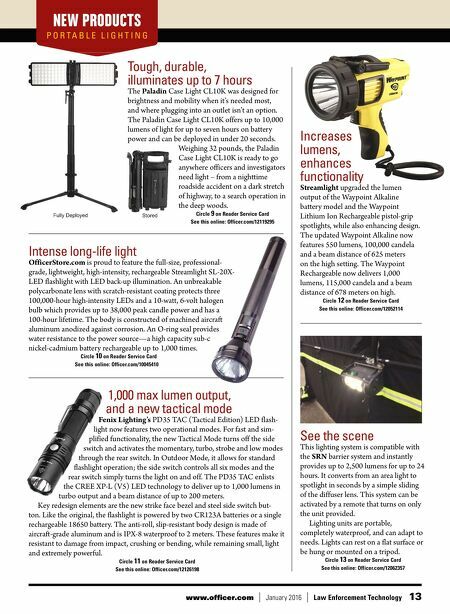 "Even if it's not with our department, but that of another cop somewhere in the country, it's worth it to us even if we never use it," he says. So far North Metro SWAT hasn't had to use the Explorer. But if and when they need to, this small ball with big technology will be there. ■ Michelle Perin has been a freelance writer since 2000. In December 2010, she earned her Master's degree in Criminology and Criminal Justice from Indiana State University. YOUTUBE.COM/C TSLESSLETHAL @COMBINEDSYSTEMSINC #C TSLESSLETHAL Circle 62 on Reader Service Card In prototypes, officers found a way to break Explorer. The company Bounce Imaging came back with an officer-proof version. Bounce Imaging ................................................... 61 For more information on these companies, circle the corresponding number on the Reader Service Card.